Our food came in daily ration packets, that had been packaged and produced by a specialist company. 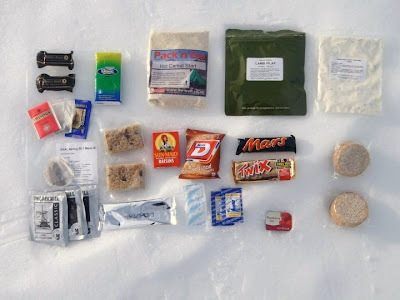 Jackie was in charge of food for the entire expedition and had left huge stashes in various locations in Nordskioldland. In general, we would usually take 2 weeks worth of food at a time, and store it in our pulks. The picture above shows our daily ration, which one of the doctors estimated to be about 5000 calories. I really liked the food, it was exactly what you wanted and cravings for peas and orange juice didn't really kick in until the end, when the temperatures began to increase. There were four different dinners and puddings so it didn't get too monotonous, and we became pretty creative. Special mention of Ade's After Dinner Mints should be made here (thinly sliced mars bar smeared with toothpaste). Daily food ration from top left: two little cheddars, packet of kleenex, breakfast (wheat based porridge), dinner (lamb pilaf), pudding (apple and custard), tea bags, 2 flapjacks, packet of raisins, dry roasted peanuts, mars bar, twix, two packets of oat biscuits, 3 portions of hot chocolate, b-fuel (beetroot based powdered squash), sugar, creamer, portion of jam. Thanks to Ant for the photo.